Battles over education are once again dominating our attention in the early weeks of 2018. In particular we're urging supporters to keep up the pressure on the Government not to lift the cap on faith-based admissions to faith schools. You can find a link to our template letter, which makes writing to your MP on the subject quicker and easier, below. 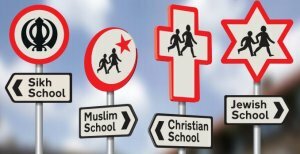 As it stands new faith-based academies and free schools must keep at least half their places open to any local child, irrespective of religion. This rule is not nearly enough to promote a secular and inclusive education system. But when the short-term alternative is to spend public money funding schools which select all their pupils on the basis of their parents' faith, it's a concession worth fighting for. The NSS has questioned why the head of an unregistered Islamic school who was banned from teaching has not been prosecuted. A highly respected primary school's chair of governors has called for Government guidance on the Islamic headscarf and fasting. The NSS has called on Belfast City Council to reconsider a ban on "offensive expression" about religious beliefs during council business. Plans to create more religiously selective faith schools appear to be back on the table. Stephen Evans says the Government risks recklessly neglecting the civic purpose of state education if it presses ahead with lifting the 50% cap on faith-based admissions. "Such a terrible sign and an incoherent signal to survivors." "Religious freedom is not a lovely antique, a family heirloom or a relic of a bygone era. It is a dynamic, progressive value that underlies every other constitutional freedom we have – and it is under siege." Maryam Namazie discusses subjects including 'apostasy', atheism and the protests in Iran. To mark Religious Freedom Day in the US, a Catholic and atheist say the true meaning of religious liberty – freedom of and from religion – is getting lost in current debates. Police have said a widely-reported incident in which an 11-year-old girl alleged her hijab had been cut with scissors did not happen. The bizarre appetite many left-leaning Canadians have for tales of anti-Muslim bigotry helps those on left and right who wish to sacrifice liberal principles. The NSS's chief executive Stephen Evans refuted the Bishop of Paisley's claims of pro-abortion bias at the BBC in The Herald. Our president Keith Porteous Wood discussed Woking Borough Council's policy of providing worshippers with free parking in pay and display car parks on BBC Surrey (starts after 1 hour 40 minutes). Our spokesperson in Scotland, Alistair McBay, wrote to Hebrides News about Sabbatarianism in Stornoway and The Courier about the BBC's religious coverage.